One of my blog friends wrote a fun piece about “peeping”, where you drive around when the foliage changes and take in the gorgeous colors and drying air of autumn. In the high Colorado Rockies where I was reared, the only ones you heard use the term peeping were transplanted yankees working or studying at the local college, famous for taking students who couldn’t get into a better college. 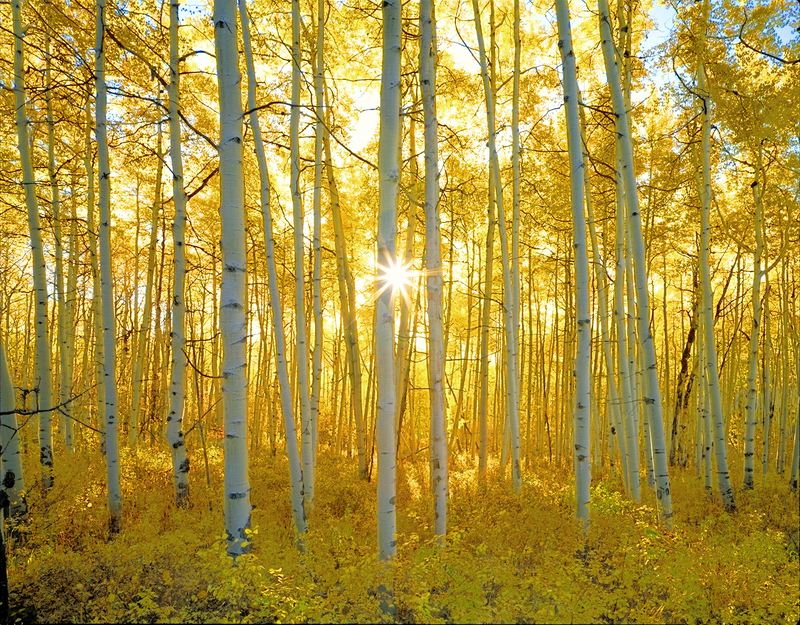 We had ‘turning’ season where the groves of quacking aspen would all turn golden yellow at the same moment. The exact time was a combination of dryness, shortening of days and cooler temperatures. Aborealists say it has more to do with the available daylight than it does with the temperature, so some years the first frost came too soon, and the turning was disappointing. The leaves would turn brown and fall. But in other years, it was mystical. You could hear the soft applause of leave as the morning winds would rattle the leaves, and a hushed peace would settle on the land. In rare years, hunting season would arrive at the same time, and so many of us equated the turning with hunting. In later years, the ever-wise legislators decided that hunters and tourists was not a good mix, and moved deer season a bit further into the year. But then, there weren’t so many tourists and one could stake out a good hunting ground quite easily. The last time I went deer hunting was one of those magical years when walking into an aspen glad was like walking into gold. I found a small meadow where I could sit on a rock outcropping and observe the entire meadow, and silently huddled into a small ball for warmth, and waited as the sun climbed rose. Then he silently appeared. A six-point buck. I smoothly raised the 30-06 to eye height, found him in the reticule of the scope, and picked a spot just back from the shoulder blade, and fired. The buck gave a hop, then stopped, and I debated taking another shot, but he didn’t move for a long time. Then he laid down and rolled over. I rose, oddly shaking with excitement and stiffness from sitting still, and cautiously approached him, using the barrel to poke at his eyelid. It was a clean kill. I stood there in the golden glade, letting the adrenalin dissipate before starting to prepare him, and a question arose in my mind. “Why did you do this?” The bucks lifeless eye seemed to stare at me for that eternity. “Great kill!” Orrie shouted as he broke through the underbrush. He had heard the shot and came to help me dress the buck out, and we got started on it. But the gold had vanished from the woods, the clapping hands were silent. It was just a meadow in the woods and the magic was gone. It never came back for me, and I see the accusing eye of that buck in my dreams. I am not against hunting. If my family needed food and I needed to kill to get it, I could, and I would. Without hesitation. But I knew this buck was a senseless kill. I didn’t need the meat. At that time, I didn’t even own a freezer. As it turned out, I never tasted the meat of that buck. I gave it all away, sold the rifle, and left the country for city life. Today when I look at a picture of a golden glade, the numinous feel is gone. I killed the unicorn. This entry was posted in The writings. I have read several friends blogs recently who are lamenting the sad state of eligible mates in the world today. The more interesting reads were from the feminine side of the conflict. I am glad I am not in the dating game anymore. I think I would fail miserably as every girls dream date. In fact, I don’t think I would make it as any girls dream date. Suave is not my middle name and a lass looking for a LTR would only consent to a continued relationship if she was in abject terror at being alone. I am like the last potato in the grocery bin when it comes to desirability. 1st fail. I drive up to the neutral meeting spot in a mommy van with peeling paint on the hood. 2nd fail. Black socks, chino’s, brown shoes, stretch belt, blue polo shirt and straw cowboy hat. 3rd fail. I would either try for a full hug, or resort to a firm conventioneer’s handshake. 4th fail. I would be afraid of even the most casual glance toward her bosom and would compensate for that by staring into her eyes, never letting my gaze drop below the nose stud while trying to hide my disgust with things fastened into snot. A lip ring would immediately cause retching at the thought of kissing someone with one. 6th fail. I would either be clingy as all hell or so insufferably aloof that the world would appear to revolve around me. I have no neutral gears. … Unfortunately, I don’t have time to compile an exhaustive list of my undesirable qualities. It would be a long one. I guess I’ll just have to keep the woman I’ve got. This entry was posted in Journal, The writings, Uncategorized. A tree is not a tree, a snake is not a snake, and a fig leaf is not a loincloth. The sun rose behind high scud that is hopefully bringing moisture laden bands of rain to the parched land, and the light woke me from sound slumber. Stagger into the kitchen and flip the switch on the coffee maker that Snookums carefully prepared the night before, and then down the hall to the studio to open the blinds for Kippur da Budgie and put on Shabbat music to start the day. As I have often said, I would prefer absolute silence until Mr. Brain wakes, but the bird needs noise. The happier the music, the happier the bird. Yours truly isn’t so chipper, however, and I tune the music out and idly flip through the evenings postings. Thanks to the internet, I have many friends on the opposite side of the world in Australia, Philippines, Singapore and now Japan who are ending their day and preparing for slumber, and friends in Europe and Africa that have half a day in already, and their comments and posts get answered at this time. And the writing muse has returned, but as usual, the beginning output is not very deep nor well crafted, so it gets written, then deleted. I am not one to save my work once it has served whatever purpose it was crafted for. And these days my thoughts aren’t on a vigorous hero who saves the world and a couple of distressed damsels in the process, but rather unraveling a mysterious thread of creation that knits seemingly disparate events into a cohesive whole. There is an ancient writing called In the Beginning that has consumed me the last many years. It truly is a riddle, wrapped in a mystery, inside an enigma, and doesn’t yield its truths to casual reading. Slowly one begins to see that one imperative that impels all mankind, the one inclination that thwarts him and the one fate that awaits him. The preacher got it right when he labeled life vain. But in all that is a hope. A higher calling, if you will. Enjolras is a fictional character in Victor Hugo’s novel “Les Miserables”. A revolutionary who clearly sees the evil of the times, and who charismatically calls the people to man the barricades against a repressive government. Of course, the young are drawn to him, never having been exposed to war and believing in something larger than themselves. There was much evil in 1836 France, just as there is in America today. Secret cabals ruled against the royalty and the people then just as they do today. I am surrounded by Enjolras’s, all warning me about the danger about us, of being stripped of liberty and made into tools of the oppressors, and if I will just join them at the barricades, we can slip the tightening noose of the oppressor. And they aren’t lying to me. From the beginning of time there were oppressors. Nimrods who seem to grasp the reins of government and enslaving man with effortless ease and putting them to work building grand towers of confusion where they rule over them. And from time to time Enjolras’s have arisen and called men to battle, only to die at the hands of the enemy after their comrades deserted them. But once in a great while, they do succeed despite their meager numbers. But always at a great cost of lives and human suffering, and great civilizations are born, only to succumb to even more clever and subtle Nimrods building their towers with the carcasses of patriots. Look, Enjolras. I took up arms, and I fought. Now I just want to go into my dotage without the sounds of cannons in my ears. OK? So how does one take a jilted ex-hippie who left unrequited love on the commune up in the Sangre de Christo mountains of New Mexico to becoming a mercenary, and later the spiritual leader and husband to a Middle Eastern convent that he and his merry band of mercs rescued and moved to Texas? At this stage of the tale, the hero made his goodbyes, and flew off in his little sport plane with Fido, a stray mongrel with strong herding instincts. Fido will be left at a pet sanctuary for older dogs since Joe wasn’t sure that he would be well taken care of at the commune, and the plane will be sold at an auction in San Antonio to provide Joe with airfare to the Middle East, where he will join his war buddy mercenary in protecting petroleum interests in Northern Iran. I wrote a little piece to help me get Joe on his way, Are you going away with no word of farewell? and to flesh out Joe a little clearer in my mind. Joe is a warrior who becomes a peacenik who returns to being a warrior. In the course of his warring, he ends up rescuing the nuns of a convent that had been raided by terrorists. Joe and his buddy enlisted the help of some very wealthy Canadians and Americans, and got the convent moved to safety in the US. The nuns were very angry with the Church that abandoned them, and rejected its authority. They felt that Joe was a warrior monk who was sent by God to rescue them, and so he was rightly the spiritual intermediary of their convent. A type of priest to them, if you will. The only problem was that they didn’t tell Joe of his elevation. At least right away. And why am I telling you all this? Because this tale will never make it out of the first edit, and will never be submitted to a publisher, and I want to complete one tale in my lifetime. So I am vamping you, dear reader. I’ll apologize in advance for the subterfuge. This entry was posted in Joe. Unrequited love themes have settled in on me during these dreary winter doldrums. I am thinking that perhaps they are the key that unlocks the trigger to my winter desolation. One theme is the hero who plugs away at a steadily declining hippie commune, and wakes up one day to discover that he is the only one who isn’t getting laid. But being that he is a plugger, he finishes up the incomplete projects, makes his goodbyes, and rides off into the sunset. Or in one version, soars off in his bush plane. I just hate the dreary sadness that settles in on me, yet I seem to delight in wallowing in it. December is bad, but by January and through February it really gets to be heavy sledding. I have made a few efforts to describe the Satanic heaviness, but finally gave it up. If you haven’t been there, you wouldn’t know. Attributing spiritual forces as the cause if it seems to make more sense to me than trying to make some sort of psychological sense out of it. Eventually, I succumb and let myself sink into the pit. It is easier than fighting it off. It is relentless. This entry was posted in Journal, The writings.